there have been lot of talking about a mapping competition since the project started. Since no one has taken the initiative, i thought it's about time get things rolling. So what's the goal of the contest? Simple, to reach as many Xonotic player as possible. Mirio and I talked about plans after the 1on1 tourney, which is currently ongoing. We thought about several things and came to the conclusion, we need something which haven't been there before. 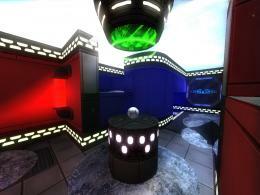 At the moment, we have only two suitable maps, nexballarena and marsball. But for a tourney more maps are needed, that's where the mapper come into play. a jury, which judges the maps. The prize for the winner will be that his map, will be played exclusively in the final. The other maps, will most likely end up as normal maps in the tourney. The team of judges will consist of Antibody, MirceaKitsune and merlijn. They'll guarantee that the best map wins. - Maps with more then 1 ball are ok, but the limit is 50 balls per map. Otherwise the map won't be accepted. The theme of the map is up to you. Join #xonotic.editing on quakenet, if you need help. An outdoor map, wow! That looks awesome, great job! Looks quite awesome so far! Though in the end, the models could be of higher quality, and the walls more detailed. -Some little mean hills in the field, to make the ball less predictable. -Speed bonus somewhere in the forest. -Arches in the doorways showed on the 3rd pic. -Some birds or/and butterflies. I know that sounds weird, but it actually is possible. (I saw it on a Q3 map on the dms votable server.) You can just make a small model, with clapping wings and let it fly around (maybe atach some sounds too). That would really give a rainforrest feeling. (11-06-2011, 12:47 PM)Mepper Wrote: -Speed bonus somewhere in the forest. I think I mean something different. I mean the powerup speed, which works just like strength, shield, or invisibility. It seamed to be the only really usefull powerup for nexball. I'll be entering too, only I've only played nexball online once, so the map might be unbalance and get a revision afterward. (11-08-2011, 02:47 PM)nowego4 Wrote: ... I've only played nexball online once, so the map might be unbalance and get a revision afterward. when you keep the layout symmetric, the chance that it becomes unbalanced is very low. (11-08-2011, 03:27 PM)Cortez666 Wrote: when you keep the layout symmetric, the chance that it becomes unbalanced is very low. I guess I meant too easy/hard to cap/too big or small for 2on2. Oh, and it's football style, hope that's okay. (11-20-2011, 04:24 PM)nowego4 Wrote: Oh, and it's football style, hope that's okay. There is still more then 1 month left, till the deadline so you have all the time you need to finish your maps and polish them. Small reminder the deadline is in 1 month. A bit late now but I also participate! (12-06-2011, 01:12 PM)Maddin Wrote: A bit late now but I also participate! Nice... need some team-colored lava? I'd be glad to share mine if you want (identical to Lava0 except color). I could also colourise them myself, anyway thank you!